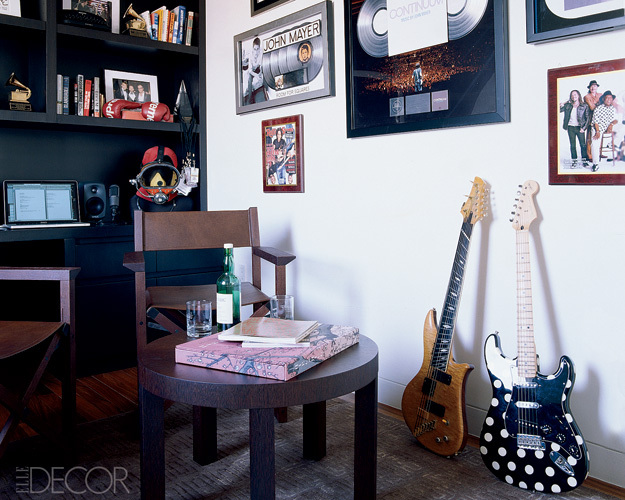 John Mayer’s New York City Apartment | Shelby White - The blog of artist, visual designer and entrepreneur Shelby White. Prior to seeing the apartment of the great musician John Mayer, I had envisioned it as a humble, brick-walled abode with guitars everywhere. How refreshing it was to see mutual tastes of contemporary interior design reflected in his home. The apartment is 2,500 square feet and located in New York City’s SoHo district. It was originally designed by Italian fashion designer, Giorgio Armani for the reason that John wanted to “feel the same way as he does in Mr. Armani’s suits.” If you note in the first image you’ll see one of the icons used in the 1972 Munich Olympic games (very much wish that was an original and not a random rendition). hmm, it’s interesting how this flat basically reflects the kind of music he makes. take that how you like.